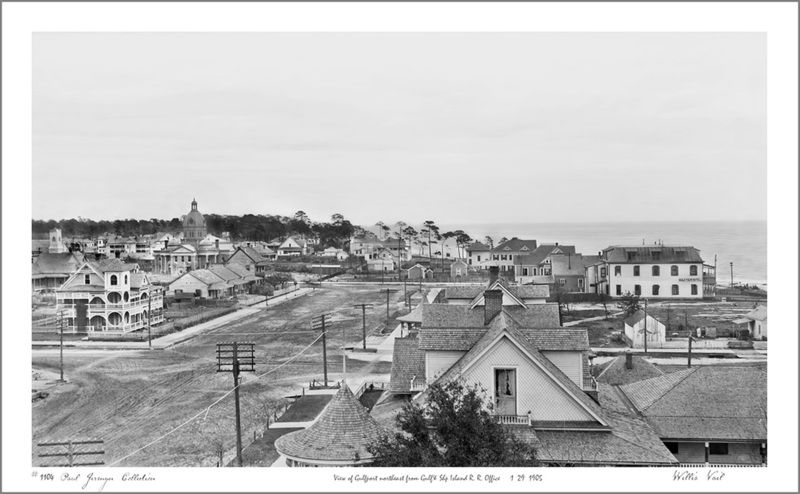 Originally a boom town at its beginning in 1898, the town grew with the construction of the G&SI Railroad and the deepening of the port. In 2013 Gulfport, by population statistics, is the second largest city in Mississippi. Its city limits encompass a variety of neighborhoods, businesses, schools, shopping areas and industrial districts. 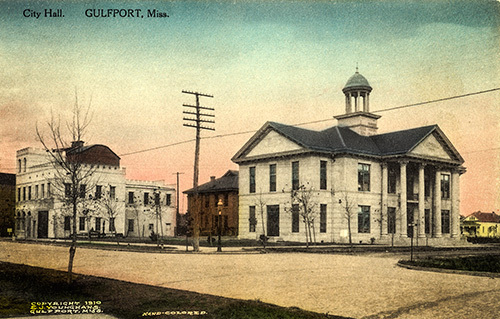 Like many towns, the downtown of the city, the “original Gulfport,” has changed. People flocked to a place of opportunity. With the population increase, came schools, churches, retail establishments, a hospital, restaurants, government buildings, banks, hotels and places for entertainment. Over the years various factors brought about changes to the face of downtown. The dirt roads became brick streets. The old bricks are now paved over with asphalt. Transportation went from horses to trolleys, buses and automobiles. The grand hotel and movie theatre have been razed. Retail outlets, including the flagship locations, Sears, Roebuck and Company and J.C. Penney’s, went to shopping malls. Of course, change to downtown Gulfport has most recently has been caused by Hurricane Katrina which brought winds, and worse, a tidal surge to structures. However, there are buildings still standing which are important to the record of the history of Gulfport. The Gulf and Ship Island office of Mississippi Company completed in 1902 is located at ---13th Street. For example, Captain Joseph Jones, the Pennsylvania oilman founder of Gulfport, built the office for his Gulf and Ship Island Railroad in 1902. 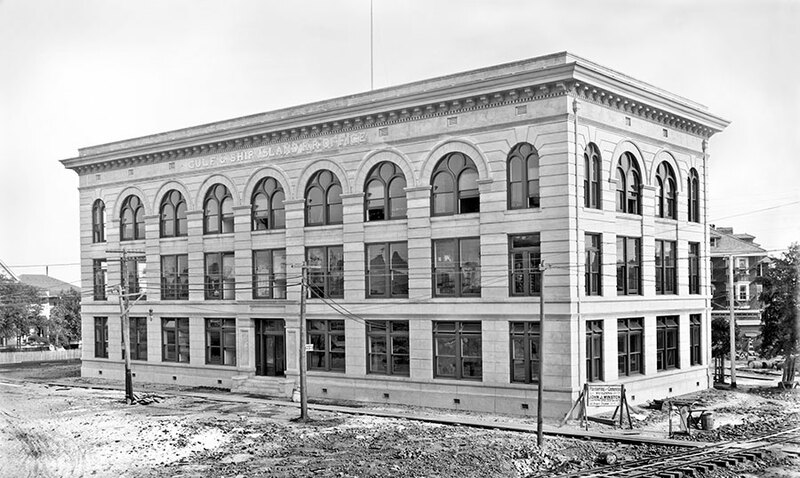 The building was renovated and the exterior was restored to its original look by Mississippi Power Company for offices. The building has survived many storms. The United States Post Office building, located on the corner of 25th Avenue (Highway 49) and 13th Street, opened in 1910. Then known as the Federal Building, the original cost of the building exceeded $100,000. The limestone structure appears much the same today. However, most postal operations have been relocated to more modern facilities. Another fine structure surviving is the Union Bus Station located at the corner of 14th Street and 24th Avenue. The Carnegie Library, located at the east end of thirteenth Street, is the only building remaining on that side of 24th Avenue still standing. The official opening was celebrated November 20, 1916. At the time it was adjacent to the Harrison County Courthouse which was destroyed by a fire in the 1970's. The opening in left side of the entrance stairway contained a time capsule which has been lost. The children's section was on the ground floor, called the basement by patrons. At the intersection of 24th Avenue and 15th is the magnificent First United Methodist Church. In the center of the dome over the sanctuary is a stained glass rosette. Built in the 1910's, this beautiful place of worship has stood through major storms along the Gulf Coast with relatively minor damage. It is one of the oldest places of worship along the Mississippi Gulf Coast. Past newer structures, including the fire department, police department, city court offices and the Dan Russell Federal Building, is Gulfport High School. The school mascot was a commodore and its class annual was the Log. Completed in February 1924, its exterior has been preserved and houses offices for the adjoining federal building. Turning right on 21st Avenue past a parking facility is the building that was the downtown Gulfport location of the Harrison County Library System. A classic 1970's design damaged in Hurricane Katrina, the structure is being considered as a community center. A statue of Captain Joseph T. Jones, a wealthy Pennsylvania oilman and principal founder of Gulfport, overlooks the park named in his honor. The only building on the east side of 22nd Avenue between 14th and 15th Streets stands the Masonic Lodge. Located on the south corner of 23rd Avenue and 14th Street is the building that was the grand Hotel Markham. Costing over $1 million when built in the early 1920's, it was named for Charles H. Markham of the Illinois Central Railroad. There was pool on the south side of the building, a coffee shop on the first floor. The two story lobby opened onto a second floor mezzanine ballroom, location for many parties and wedding receptions over the years.